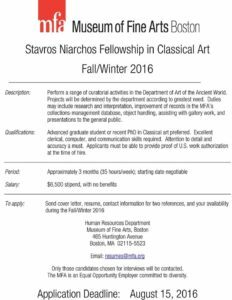 The Stavros Niarchos Fellow in Classical Art will perform a range of curatorial activities in the Department of Art of the Ancient World. Projects will be determined by the department according to greatest need. Duties may include: research and interpretation, improvement of records in the MFA’s collections-management database, object handling, assisting with gallery work, and presentations to the general public. This is a temporary position for approximately 3 months; starting date negotiable. 35 hours/week; Mon-Fri, 9:00am-5:00pm. Stipend is $6,500, with no benefits. 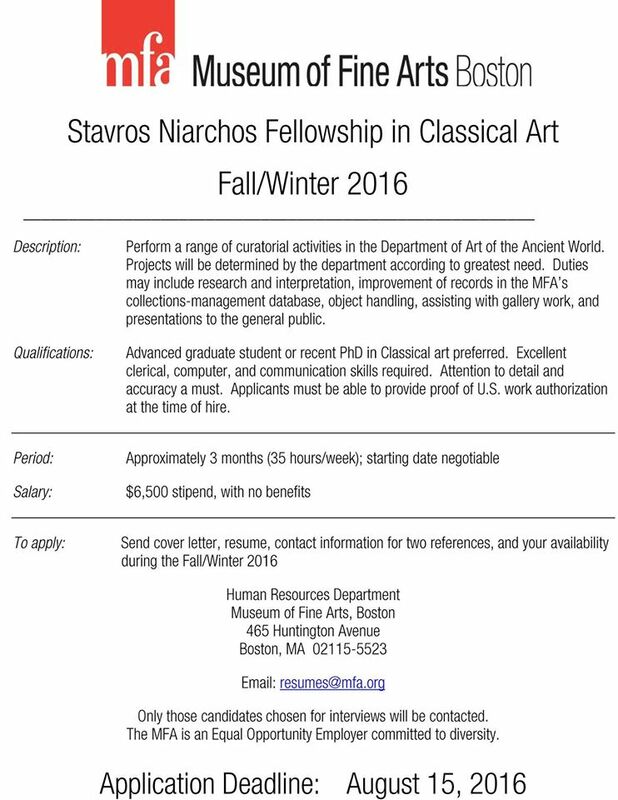 Advanced graduate student or recent Ph.D. in Classical art preferred. Excellent clerical, computer, and communication skills required. Attention to detail and accuracy a must. Applicants must be able to provide proof of U.S. work authorization at the time of hire. 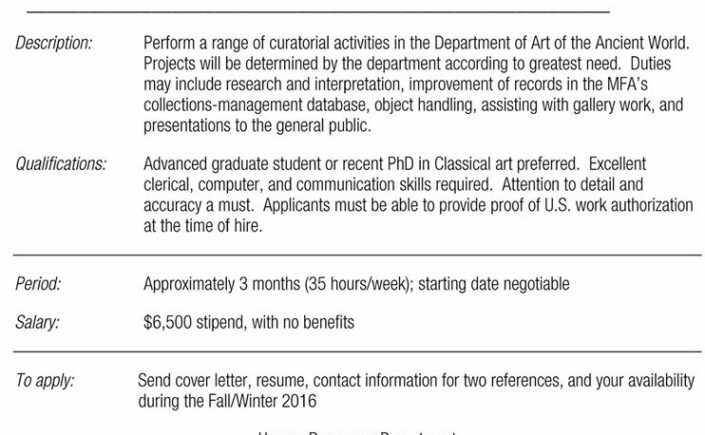 For consideration, please submit your letter of interest, résumé, contact information for two references, and your availability during the Fall/Winter of 2016 to: resumes@mfa.org. You may also submit your materials via postal mail to: Human Resources Department, Museum of Fine Arts, Boston, 465 Huntington Avenue, Boston, MA 02115. Only those selected for interviews will be contacted.